Holy crap! Is this a drawing?? Why yes it is! Character: Link, Navi, & some Wolfos. Actually, this piece was an experiment for me. I wanted to try and make a picture that was done fast (well faster than I usually color) but still have the amount of quality I require from myself. I was faster for sure, and I am very pleased with the overall result. I do feel though that with practice I can do much better and be much faster. So hopefully this will be the first of many new drawings to come. I hope you enjoy. 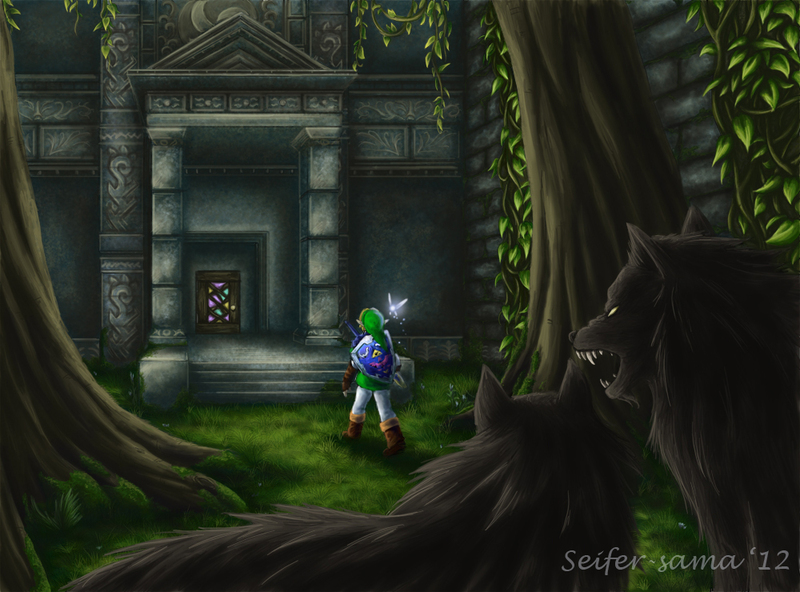 frack the forest temple. That shoot was so confusing! That background is so impressive! That grass and those carvings/details in the side of the temple. I like how you put the wolves in the foreground. Also, the detail is spectacular! Lovely! I absolutely love it! The amount of hours you put in it really shows in your details. The use of perpective is very well done. The wolves look EXTRA welcoming! I like it. ^_^ The whole thing is quite nice, but for some reason the engravings on the temple wall especially catch my eye.